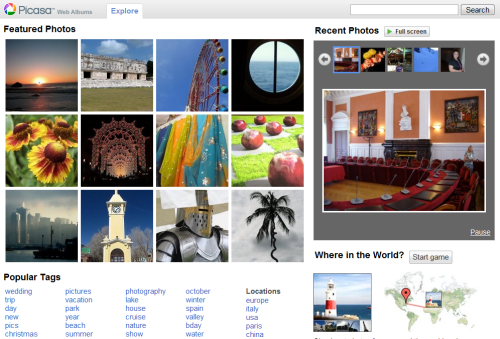 The new version of Picasa Web Albums added a simple game called "Where in the World". Your mission is to find the correct location for some photos that are already geolocated. To find the game, go to the Explore section and click on "Start Game". Inspired by Flickr, Google created a new section that displays features photos, recent photos, popular tags and locations. The new interface looks nice. :) And, I do agree that Chrome is very very fast! I'm Chroming the web and I'm loving it! It seems that Picasa is slowly Flickring itself. That is great news! I hope it doesn't stop now because there's still a lot to do! Nice. More fun than the Image Labeler. IF they supply some conditions like Flickr (unlimited for 25$/year) it would be competetive. Google Chrome is awesomely fast, I'm never using anything else for my gmail inbox! However, it will not be my main browser for anything outside of google (as all the web applications are so much faster in it), as I cannot access my online google bookmarks through it. I want many of the fatures of google toolbar in it. Come on google: a webbrowser which cannot intergrate your online bookmark system? the one which works so well within IE and FF using the toolbar.